Our September/October issue went to electronic subscribers last week and is in in the mail to print subscribers now. We’ve just posted one of the two cover stories, Zelda Bronstein’s California Yimby’s: The Growth Machine’s Shock Troops. Attendees of the YIMBYtown 2018 conference, which just got underway in D&S‘s hometown of Boston, may be interested in our take on the ostensibly progressive, yet pro-development, deregulatory movement. Getting below the surface may help us understand why Trump’s HUD secretary, Ben Carson, seems to have endorsed Yimbyism. The United States faces a crisis of housing affordability and displacement. It has been brewing for a long time, and it is getting worse. A Pew Charitable Trusts study released this spring found that, as of 2015, 38% of the over 40 million households that rent their homes were “rent burdened,” handing over 30% of their income (and often much more) to rent. Cities like Boston, New York, and San Francisco receive the bulk of attention because of the dramatic and large-scale examples they provide of gentrification and tenant hardship. But these trends now extend to dozens of small- and medium-sized cities across the country where populations have grown while the housing stock hasn’t—and public policy has done little to alleviate the problem. 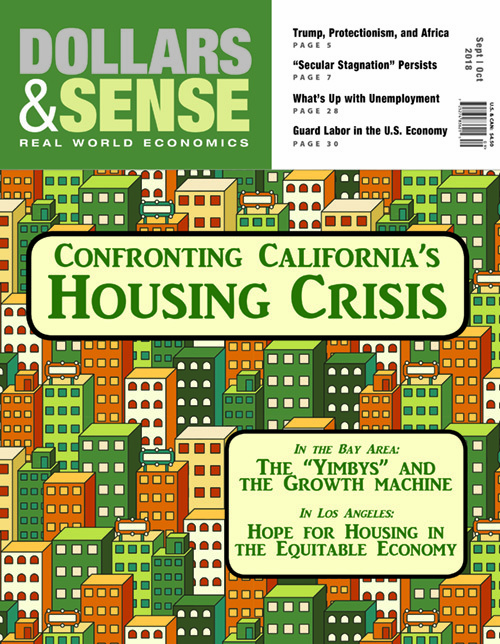 Our cover stories in this issue focus on the situation in California, where over half the renting population is rent burdened—the highest percentage in the United States. But they hold lessons for people anywhere struggling with rising rents and inadequate or substandard housing. Journalist Zelda Bronstein’s analysis of the “Yimby” (Yes in My Backyard) movement, centered in the Bay Area, uncovers the shortcomings and inconsistencies of a “build baby build” strategy. The Yimbys believe that a lack of supply is the main cause of the crisis, and their principal solution is to roll back nearly all zoning regulations to make way for private development. Bronstein calls on us to question the neoliberal growth machine, and makes the case for policies that pay attention to the demand side: rapid population growth that strains existing city infrastructure. Then urban studies professor and activist Jane Paul brings our focus down to Southern California, in the third part of her series on building a solidarity economy in Los Angeles. She covers a number of housing initiatives underway that could curtail displacement while strengthening and democratizing urban communities—and points toward policies that would help these projects flourish. In the other feature in this issue, David Bacon exposes the long-term causes of Central American migration to the United States. Current U.S. border and detention policies bring suffering to migrants who have already suffered from over three decades of U.S. trade policy and support for right-wing regimes in Central America. As a friend of Bacon’s from Guatemala argues, migration to the United States is a form of resisting empire. People in the United States should fight to end cruel immigration practices, but they must also work to dismantle policies that make it impossible for many Central Americans to remain in their home countries. Elsewhere in the issue, geographer William G. Moseley examines the damaging effects of current trade policies in Africa. Trump’s reckless and racist protectionism threatens to set back the development of real alternatives to the Washington Consensus on free trade, which has had such devastating consequences for many African economies. John Miller’s “Up Against the Wall Street Journal” column revisits the recent debate around “secular stagnation”—a long-term, structural slowdown in growth in the Global North. Contrary to the pronouncements of the right-wing business press, the pace of growth in the United States under President Trump doesn’t change the fact of deeper problems related to shrinking private investment and inequality. The “Trump recovery” is sustained by tax breaks, corporate borrowing, and instability in financial markets, and it merely pushes the big problems down the road. When it comes to job growth, we’ve seen similar superficial signs of health—a long expansion of employment since the depths of the Great Recession that has continued under Trump. Some of this news is undeniably good, as Gerald Friedman shows in his “Economy in Numbers” column, but the labor force participation rate is far below its pre-recession peak, and job growth has done little to increase wages. about labor devoted to social control; MacEwan shows how closely “guard labor” is correlated to inequality. And Steven Pressman reviews of one of the best Marx biographies in living memory, translated just in time for the bicentennial of Marx’s birth.